The iPad is a great device to keep in communal areas, like a living room, where people can freely use it to read books, play games, surf the Web, and use apps. Unfortunately, this makes a communal iPad less than ideal for checking private e-mail accounts, since anybody with access to the iPad will have unrestricted access to the Mail app as well. To address this, Lilliput Labs has released Mailboxes for the iPad, a multi-user Gmail client that provides an easy and secure way to access your Gmail or Google Apps email on a shared iPad. Mailboxes manages multiple account credentials for you, storing them securely in the iPad’s built in Keychain. Once you install the app, simply enter your credentials and set an optional 4-digit pass code. When you want to access your Gmail account, open the app, enter your pass code and Mailboxes will load up your e-mail in the familiar Gmail Web interface. When you’re finished, or when the iPad locks, Mailboxes automatically logs you out, leaving the iPad—but not your e-mail account—open for communal use. 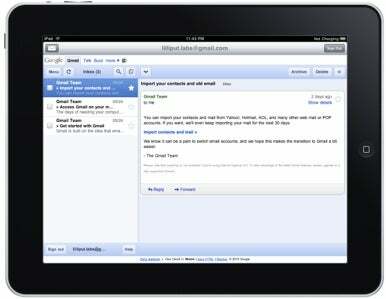 Mailboxes, which sells for $3, runs on any iPad running iOS 3.2 or later.